The Skinny: A plot (and film techniques) you've seen before, but with more than enough of an edge to make it all seem new again. 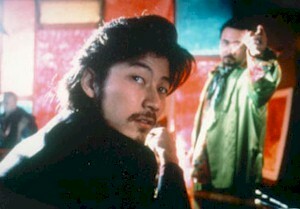 Before Tadanobu Asano was Kakihara (Ichi The Killer) or Dragon-Eye Morrison (Electric Dragon 80.000 V), he played Samehada (Shark Skin), a shady character on the run from five cars full of Yakuza in the mountains of Japan. After stealing ¥100M from them, he's managed to stay half-a-step ahead without much effort or care when he runs into Momojiri AKA Peach Hip (Sie Kohinata), herself newly on the run from her extremely creepy uncle (Youhachi Shimada). Yes, it's another "On-The-Run-From-The-Mob" movie, but the film's plot isn't as important as its cast of eccentric characters. Besides Shark Skin and Peach Hip, we also have a white-haired punk with an uncanny sense of smell, a hitman with a fetish for knives and laquered advertisments, and a completely over-the-top mouse-voiced assassin with as many sexual issues as the man who hires him (the creepy uncle). As a matter of fact, there's not a normal character here, and the exercise is to throw them together, add some conversation and firearms, and see what happens. I don't think I'm spoiling anything by saying that most of the characters die by the end in frequently sudden ways. All this occurs between quiet events which push the plot towards more violence or punctuate everyone's oddness (though Shark Skin and Peach Hip seem damn normal in comparison to everyone else). From Shark Skin's semi-naked, post-coital run from the mob at to a meeting with his chair-collecting friend who provides new clothes and passports to the climactic scene in the creepy uncle's hotel and surrounding forest, there isn't much to think about. If you wanted to, I'm sure you could come up with all sorts of deep subtexts here. Is all this a clever post-modern commentary on modern day Japan? No, it's an excuse to be cool and have fun with guns, narrative, and direction. Like a lot of movies, overanalyzing the film will tarnish it. It's not art, exactly. The story can be broken down like so: Peach Hip runs away, meets up with Shark Skin, they make a brief attempt at fleeing the country, and eventually have to confront their pursuers. Yes, of course there's more to the plot, but that's the gist. To pad it out to 105 minutes, then, what you have is a lot of disconnected narrativemost especially between the odd collection of Yakuza. They talk about some past jobs, try to remember the name of a book on yoga (there's a fairly twisted reason why they're trying to remember it), talk about a funny thing one has in common with a cop, all the while displaying a very clear and deep understanding of their pecking order. There are also flashbacks, a flash-forward, brief dream sequences and long quiet camera shots. A few conventions are broken: Shark Skin isn't desperately trying to escape the mob but is refreshingly confident and cool about the whole thing. Also, the mouse-voiced assassin the uncle hires ends up being a fairly unique character, and there are a few moments that simply don't play out according to the rules of movie predictability. And, an open ending is punctuated by a few scenes that wrap up a seemingly insignificant aspect of the story with great charm. Sound plays a big role as well. It frequently becomes isolated to freeze the scene like an aural slow-motion, and is countered by the effective use of a good soundtrack. Like most of the directorial touches there's nothing really innovative about it, but it's effective nonetheless. As a matter of fact, from the semi-animated opening credit sequence to an effectively edited gun battle in a hotel lobby, there's nothing particularly innovative about this movie at all, yet it all hangs together in a very entertainingand perversely freshway.